Today is New Year’s Eve and I have just come across a photo of my friend Geoff aboard his Achilles 24. The photo was tucked under a pile of clothes in a drawer. I was immediately reminded of when I took the photo at Baltimore, a small port on the southwest corner of Southern Ireland/Eire. I had been cruising with my friend Geoff, and Baltimore was the last port of call before our return to Plymouth. The cruise was memorable because of the exceptionally stormy weather. We experienced two nasty gales: the first was on the outward crossing from Falmouth to Kinsale and the second was between Baltimore and the Scillies but closer to the latter. Geoff had never experienced being at sea in a full Force 8 and understandably he was anxious. Had we been aware of an approaching weather front we would not have set sail. The barometer gave no indication that there would be such a rapid fall of pressure, and the ship’s radio used for the shipping forecast went on the blink. By that time the sea had become so rough we had the heave to; it was dark and we were somewhere north of the Scilly Isles. At least in that position we were not likely to be in the track of shipping because the separation channels were way behind us. Visibility was very poor and there was driving rain. Needless to say, we had a very uncomfortable night. Next morning the wind decreased so that we were able to make good progress towards Kinsale. About twenty miles off the coast we had a fabulous encounter with a very active pod of Minke whales that encircled us, but we were not in the least frightened by their curiosity. That was the highlight of the cruise. We had two days at Kinsale before sailing to Glandore, then on to Baltimore. The coastal scenery was second to none. At Baltimore we had to delay our departure for the Scillies because of gale force winds. After monitoring the weather forecasts we believed there would be a calmer spell. We set off, but twenty-four hours later we found ourselves in yet another gale at night, in almost the same spot as the previous one. The seas were more vicious, necessitating the yacht to lie-a-hull. At dawn the wind had decreased sufficiently for us to continue towards the Scillies and our arrival was spectacular with waves breaking on the high rocks of Shipman Head to starboard and Kettle Point to port. 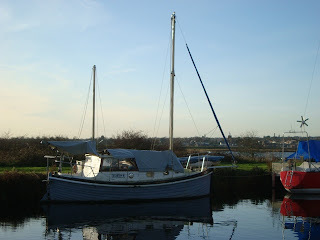 As soon as we were in New Grimsby Harbour there was almost a dead calm, and the sun broke through the thinning clouds. Our return to Plymouth was uneventful, except when fishing for mackerel we caught a garfish in St Mary’s Sound. We also caught more than enough mackerel for a hearty meal. I have included links to information about Achilles 24 yachts. They are remarkably fast and able yachts. While on the subject of sailing records, Laura Dekker is enjoying the warmer weather of the Southern Atlantic as she sails northwards. Having left Cape Town on 27th November, she would appear to be aiming for the Caribbean, in particular the Island of St Maarten. On arriving there she will have completed a solo circumnavigation of the Globe and she will become the youngest person to have sailed around the world in the truest sense, i.e., returning to a port of departure after crossing every meridian and having crossed the equator, completing a voyage of at least 21,600 nautical miles. 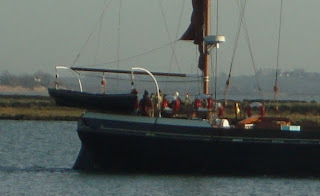 In fact she will have sailed much further since setting out alone on her world cruise from Gibraltar on 21st August, 2010. 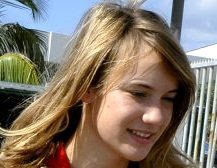 Jessica Watson is acknowledged by many as the youngest person to have circumnavigated the world alone, non-stop and without outside assistance, but according to the 21,600 miles criterion technically she misses out. Jesse Martin officially holds the record for the youngest to do a non-stop circumnavigation. To the best of my knowledge Mike Perham actually holds the record for being the youngest to have sailed solo around the world, but it looks as though Laura will shortly will take that honour. Laura Dekker, Exemplar of Youth Today? Following on from yesterday’s blog I have a few more thoughts about the type of vessel Sven may design. For some reason he has decided on a length of 10’ which is small for such a venture. Maybe he has chosen that length because he made mention of the Around in Ten Race which never took place. Originally there were a number of aspirants who intended racing around the world in 10 sailboats, but for various reasons none were able to make it to the start line. The challenge still remains for someone to succeed in doing a circumnavigation in a smaller boat than the smallest, i.e., Serge Testa’s, ‘Acrohc Australis’. She was 11’ 10” long. Ten feet would be pushing it to the absolute limit, on account of internal space for a solo sailor and his provisions. This would not be a non-stop attempt. On that basis, if Sven were to succeed, he most likely would become the ultimate winner of a world record, but I feel sure he would not be looking for accolades or approval on that account. 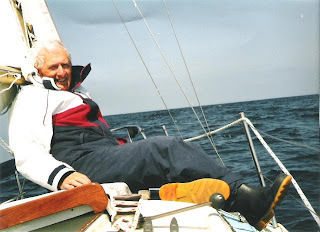 He says he wants to celebrate 50 years of his life during which time he has sailed across oceans aboard small boats, most of them designed and built by him. A solo circumnavigation in the smallest of boats would be his way of celebrating. 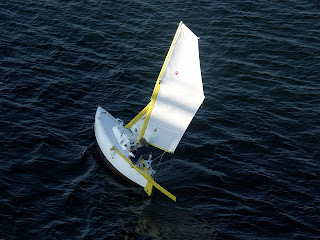 Yesterday I suggested Sven’s new boat may turn out to be a bit like Paul Fisher’s Micro 10. Well, that was in profile, not in terms of 3-dimensional form. Instead of having double chines she may have single chines on each side and she may have chine runners as per his present boat. She could even be a round bilge boat, although I doubt it, because his preferred building method is sandwich composite which does not easily lend itself to multiple curved structures. 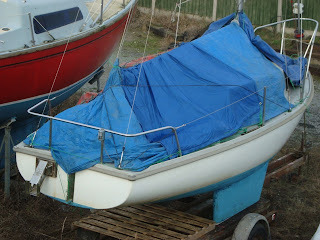 I also suggested his new boat may be fitted with a skeg to help with downwind sailing, but I remember that he locked the rudder of his present boat, which in effect became a versatile skeg that could be used in conjunction with the sails to bring about equilibrium for maintaining a steady course. 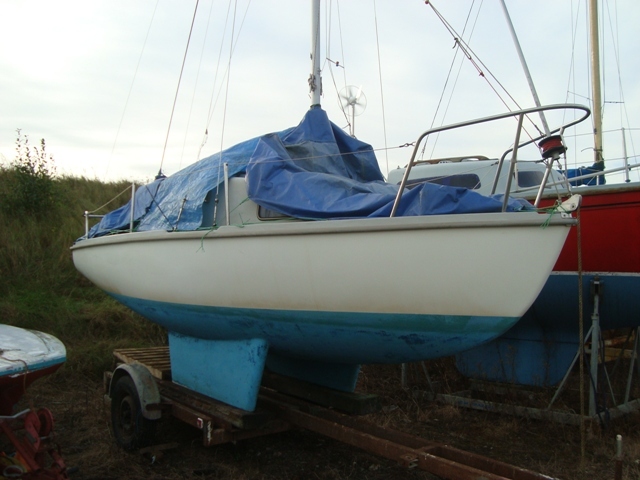 His boat may also dispense with a conventional keel because it would not help when lying to a sea anchor or drogue. One of the biggest problems with small boats is keeping them dry inside. If the crew is to maintain his health over a period of many months he must keep his body dry and warm. On that account, I doubt Sven will swim in the cold waters of the Southern Ocean as he did in the warmer waters of mid Atlantic. He has already perfected a system of watertight vents for providing fresh air within an otherwise sealed cabin, but for this 10’ boat he will need to insulate the interior for maintaining a bearable temperature. Some form of heating may be required, which could pose a problem for the storage of fuel to power a heater. Top quality thermal clothing may be the solution obviating the need for a heater. Just a thought – Do you think a scaled-down 10’ version of a John Welsford ‘Fafnir’ might fit the bill for a solo circumnavigation record attempt at being the smallest? I wouldn’t choose to sail south of the Great Capes, however. I suggest this as food for thought - not a recommendation. John would give an honest opinion. 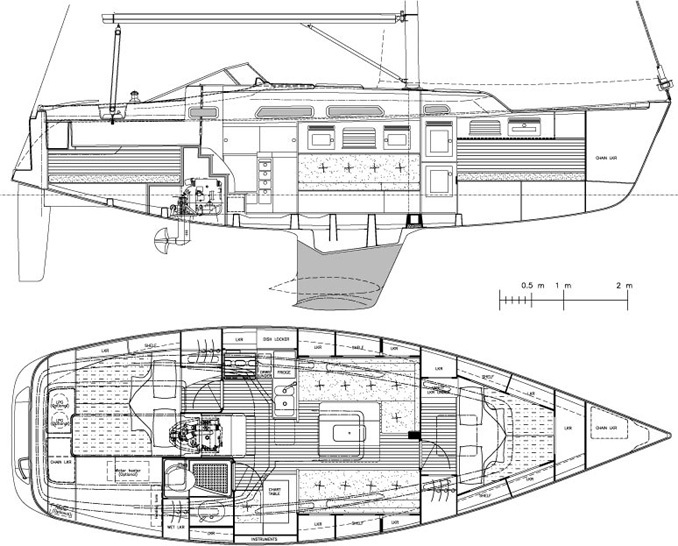 You will note from yesterday’s blog that Sven Yrvind has announced that he intends designing and building a 10’ micro yacht for making a single-handed voyage south of all three great capes, i.e., Cape Agulhas, Cape Leeuwin and Cape Horn. In so doing he would also sail south of the Cape of Good Hope, South West Cape of Tasmania, and the South East Cape of Tasmania. Many of us will be itching to learn about the design of his new boat. For sure, she will not be like ‘Yrvindaren 4.1’, because there would not be sufficient room for Sven and his provisions for a period of 12 months, which is the time he believes it will take. 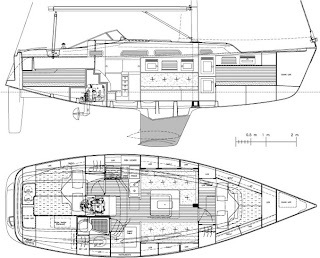 She could be a shortened version of his latest hard chine micro yacht, but with more internal volume brought about by increasing the height of her sides and by fully extending the upper cabin structure to the width of her full beam. 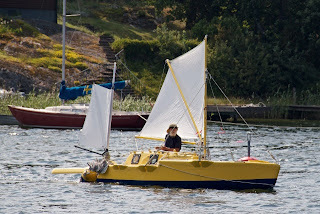 He has said his next boat will have an aft steering position, in preference to the central one of ‘Yrvind.com’. This new vessel will essentially be a downwind drifting ‘pod’ capable of withstanding large breaking waves characteristic of the Southern Ocean. Yrvind will want to avoid icebergs; therefore his passage will be far enough north to be clear of them. These factors will require that his tiny boat can be sailed with the wind on her quarter and she must have reserve buoyancy in the bow, which will require a fairly full, possibly spoon shaped bow. There may be times when the sea state is extremely rough because of winds well in excess of Force 8, in which case, Sven may opt for a series drogue for riding out the seas. In fact much of the voyage could be sailed backwards at a leisurely pace while Sven is wedged in a secure seat, even strapped into it, no doubt reading his choice non-fiction books. For sailing downwind, a skeg at the stern would help orientate the bow away from the wind, and a mast forward of the centre would enable very small twin boomed headsails to be deployed so as to form a ‘V’ facing into the wind, which would also keep the boat pointing downwind. Both clews could have sheets attached to the tiller for simple self-steering. A long keel would be helpful for maintaining directional stability and for minimizing yawing. All of these requirements make me think Sven’s new boat may look a bit like Paul Fisher’s Micro 10, but I doubt he will go for a lifting keel. On the other hand, he may want a keel of sorts, perhaps shallow twin keels for when making into land to find a safe haven. He does not rule out stepping on terra firma, and if there is a suitable place where he can safely get ashore, he may want to, in his own words ‘stretch his limbs’. 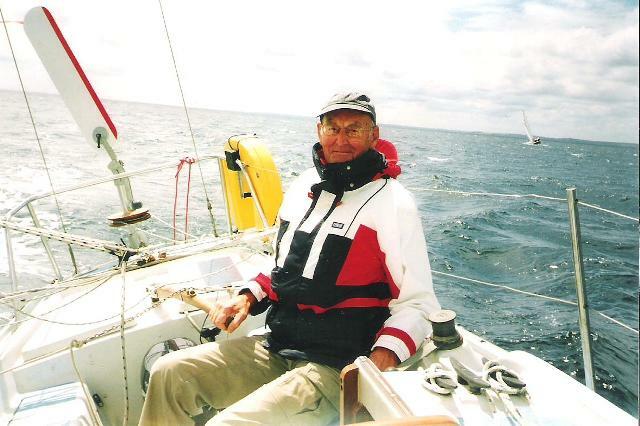 Of all the small sailboat sailors, Sven is perhaps the most remarkable. You only need look at my previous articles to learn more about him. (See links below.) 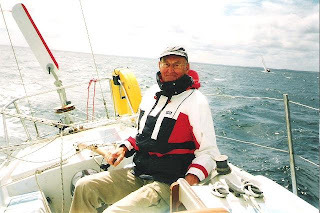 Like one of the early small sailboat sailors, John MacGregor, he is an excellent self-promoting publicist, an individual who has influenced many people by his exploits at sea, and by lecturing and by writing. Not a man who rests upon his laurels and one with boundless energy at the age of 72, he has published at his website his latest plans. 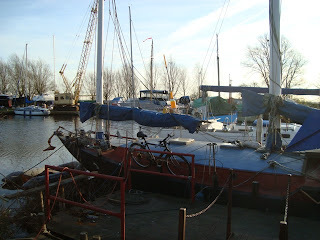 * He intends designing and building a 10’ boat to sail non-stop around the world. His definition of a global circumnavigation differs somewhat from the more common one, i.e., a passage of at least 21,600 nautical miles (40,000 km) crossing the equator and every meridian, finishing at the same port as that of departure. Sven’s definition is a voyage that crosses ‘all the meridians’ like that of Vito Dumas. He completed a voyage from Buenos Aires to Buenos Aires east-about, passing south of the great capes. Satisfaction is had from writing a blog by knowing there are readers who enjoy reading it. Over the past two or more years I have kept an eye on the number of page loads, unique visitors and returning visitors to the website. On all counts they have increased. Between 60 and 80 regulars faithfully log on every day. Unique visitors generally amount to over 300 a day, and page loads can be between 500 and 700. Statistics are from http://statcounter.com for which I am very grateful, especially as they are provided free of charge. One thing to be noted is that all of the popular pages have as their subject matters, yachts, boats, or sailors. Without readers, doing a blog is almost a pointless exercise; therefore I want to take this opportunity to thank you all for your support and to wish you a very Happy Christmas. I shall be offline for the next two or three days as I take a festive break. 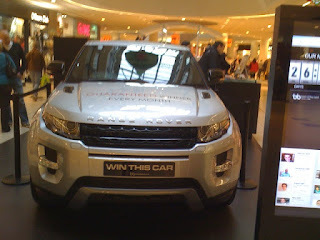 The Best of the Best Win a Supercar competition for a Range Rover Evoque Prestige was taking place at Lakeside when I happened to be there accompanying my wife who was looking for a Christmas present. I could not but notice this strange car which was parked by the 3 Store within the inner concourse on the ground floor. I felt there was something inherently wrong with its appearance, because the roof looked as if it had been squashed down at the back, but that was an optical illusion. In fact the roof was almost horizontal and parallel to the ground. The odd visual effect was caused by the shape of the windows which narrowed towards the rear of the car. The front end looked like the head of a monster with shark-like eyes (headlamps) and a mouth full of sharp teeth (grill) for tearing me apart. I was distinctly uneasy in its presence. Everything about the car was macho – a bionic machine with bulging muscles like those of Mr Universe. Get in its way, you wouldn’t stand a chance. 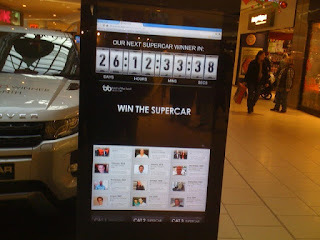 At £5 a time for entering the competition, a spot the ball interactive computerized game of skill, you will be throwing your money away except for a small portion that will go to a charitable cause. Consider the matter - since 2005 B OT B has donated £117,000, but the Plc has raised 2 million pounds (net of expenses)! 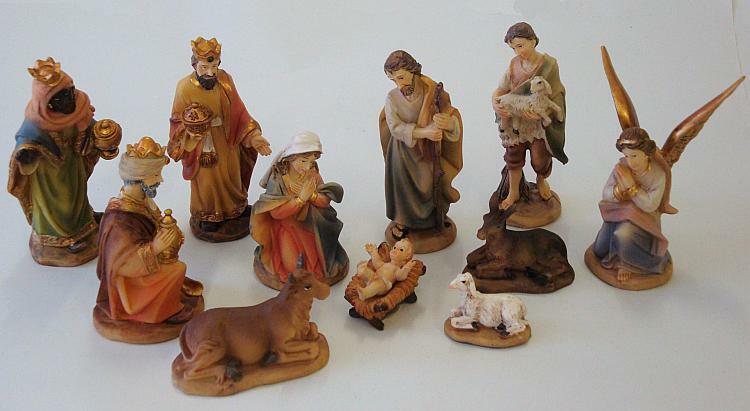 Traditional nativity cribs usually contain modelled or carved figures representing biblical characters associated with the account of the birth of Jesus. These figures are invariably arranged around a centrally placed baby Jesus who is laid in a manger on the floor of an open barn-like structure. 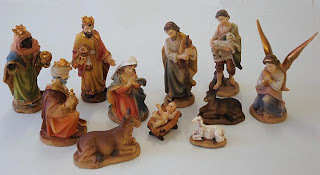 For a complete assembly there are usually figures representing the baby Jesus, Mary His mother, Joseph His legal father, three Wise Men (Magi), the Angel Gabriel, at least one shepherd, a donkey, a cow, and perhaps a couple of sheep. 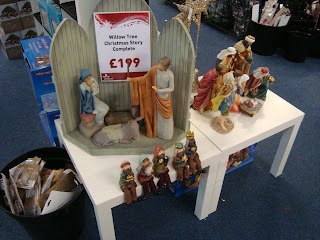 More correctly a nativity crib should contain a number of figures representing shepherds who had been visited by ‘an angel of the Lord’* when they were keeping watch over their sheep. 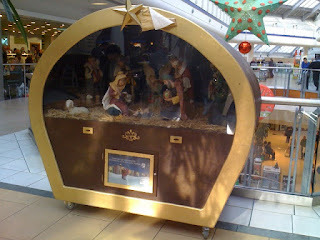 He told them that they would find the Babe (Jesus) in a manger. They went to Bethlehem and found Him there along with Mary and Joseph, just as the angel had said they would. Afterwards the shepherds told many people about their experiences before returning to their abandoned sheep. The Magi, not necessarily three, because no mention is made of their number, actually visited the young Child later, when He and his parents were in a house;** they worshipped Him and presented Him with gifts of gold, frankincense, and myrrh. 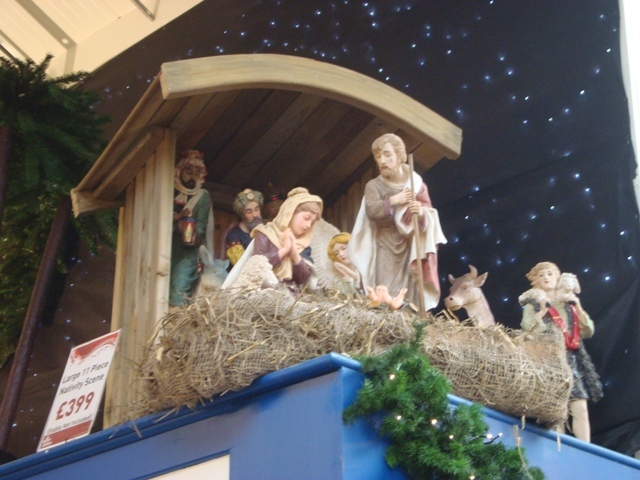 So, strictly speaking, a nativity crib should only contain a number of figures representing shepherds, the Christ Child and His parents. 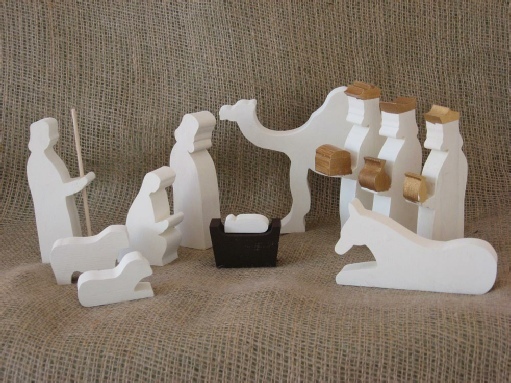 On the other hand, it would appear that artists or craftsmen creating these things, do so with artistic licence, and include figures associated with events before and after the Boy’s birth. My sister lived in Bristol. Her husband was away in the Malayan or Burmese jungle (I know not which) fighting alongside Ghurkhas, crawling through leach-infested jungle in the service of his Country. My mother and father sent me off to Bristol Temple Meads Station where I was met by my sister, my eight year old niece and her younger brother. I had a label tied to my lapel as if I was a parcel and I was placed under the charge of the train guard who was responsible for the contents of the guards van. It was a steam locomotive in those days. He carried red and green flags attached to short-handle staves. He waved the green one for the driver to start the train and quickly joined me in the van. My sister lived in a small terrace house, which was a fifteen minute bus ride from the station. I thought her house was antiquated with its gas lighting. Even the street lamps were powered by gas, and before nightfall they were lit by the local lamplighter. 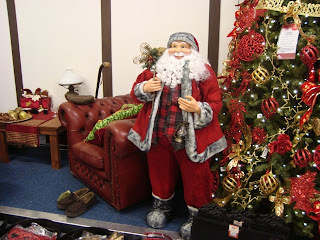 He had a long pole with a flint striker at the top, and a hook for turning the gas on and off. Coal and wood fires provided heat in the house. That Christmas was my first away from home, but I was not in the least fretful, for I had the company of my niece and nephew, and a loving sister who was more like a second mother. There was a real Christmas tree in the corner of the back room. 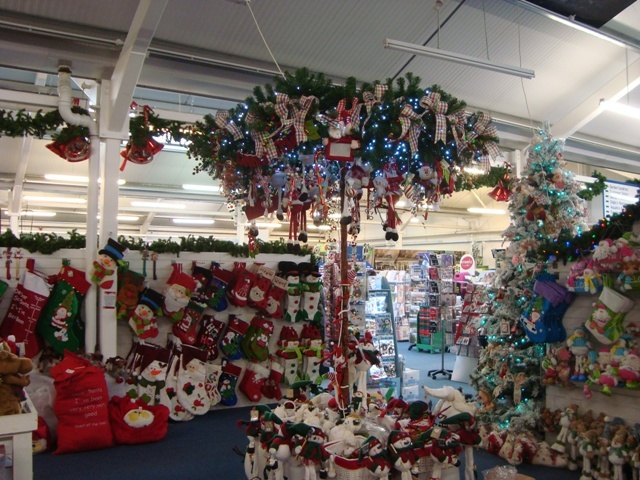 It was decorated with tiny candles clipped to the ends of its branches, and there were also colourful baubles hanging from threads tied to the branches. Flickering flames from a Yule log were reflected from the tiled hearth. A long embroidered mantel was draped over a wrought iron shelf above the fireplace upon which there were a number of Christmas cards. Overhead paper chains were looped from each corner of the ceiling to a central roundel from which a pendant gas light hung. My sister busied herself frying eggs and chips while we children were left to play. All of a sudden there was a loud crackling from the fireplace, and immediately one end of the mantle was alight. In alarm I called my sister who rapidly brought a bowl of water into the room and doused the flames. She calmly removed the remains of the mantel, replaced the cards and cleaned the hearth. Finally, she covered the fireplace with a metal mesh guard. The house could have been an inferno within minutes had she not acted so promptly. It was Christmas Eve. Each of us was given a nylon stocking which we hung on the end of our metal frame beds. I slept in the box room. Early on Christmas morning we were woken by my sister and we eagerly found our stockings which we were not permitted to open until we gathered on the large double bed in the front bedroom. It was still dark outside. The gas lamp fluttered as it cast its feeble yellow glow. 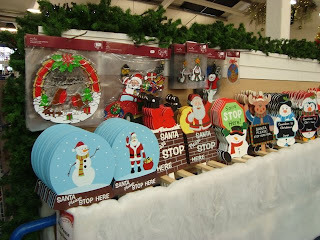 We groped inside our stockings and pulled out one item at time. They all contained identical articles: a small bag of liquorice allsorts, a party horn that made a duck-like quacking sound, a packet of wax crayons, a paper bag filled with hard-boiled sweets, a Christmas hat and an orange. In addition to our stockings there were parcels for sharing. We eagerly tore them open to reveal, cardboard puzzles, games of Snakes and Ladders, Ludo, Tiddlywinks, Draughts and drawing books. Candles on the tree were carefully lit at dinnertime and again at teatime, but only for ten minutes or so at each meal. There was Christmas pudding with silver threepenny bits hidden in it at both meals. We played all day and had much fun. Our Christmas was to us a wonderful time, and over sixty years later, I remember it so well. Illustrations are of stuff sold today. £399.00 - The real Babe is for free! 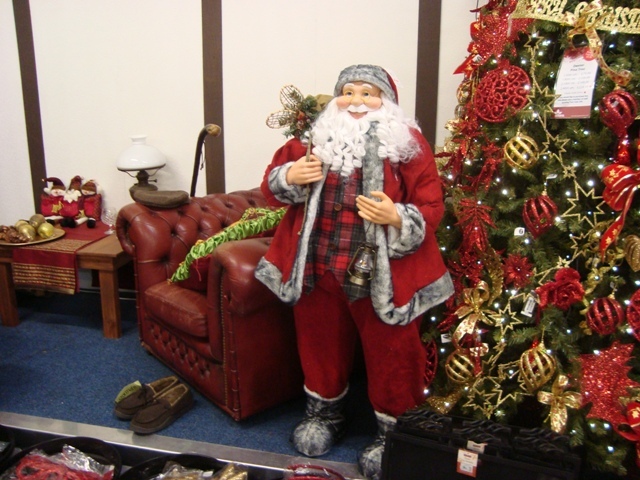 Christmas has been hijacked by those who would make a profit by cashing-in on the vulnerable who are duped by their salesmanship. The whole meaning of Christmas has been distorted and twisted, far removed from the real Christmas story, which in truth is not a story, but a fact of history: God’s Son was born of a virgin in the filth of a stable. Now that’s an incredible, but true fact. 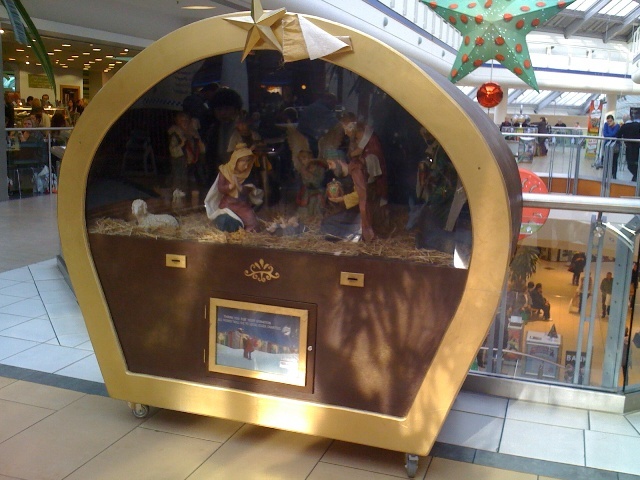 Equally true, this Child was just like any other male infant, except He was born without sin. His mission was to reveal the love of His Father for all mankind, and by His death on a cross to make a way possible for those who would believe in Him to receive His love with great joy. 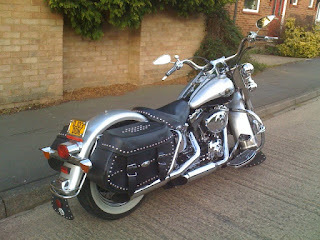 I know very little about motorcycles, but a name that comes to mind is Harley Davidson. 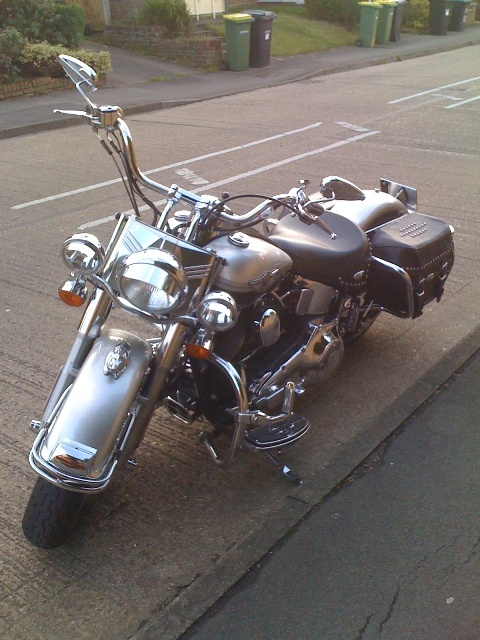 I had a ride on the pillion seat of my father-in-law’s classic Harley Davidson and I remember being impressed with the awesome power of the machine. In those days, riders were not required to wear helmets, and at the time of my ride, I was a little fearful of coming off the bike. Not being in control added to my churning stomach as the bike leaped over bumps and crevices of an uneven road leading to a dusty cul-de-sac where the stallion skidded to a halt. The return ride was no less frightening, and I was glad to alight from the saddle, once again to be a master of my own destiny. Before that time, when I was doing National Service, I convinced myself I should learn to ride a motorbike. To that end I borrowed one of the standard bikes used by riders who accompanied road convoys. I think it was a BSA, but what model, I wouldn’t have had a clue. With some trepidation I sat astride the machine; kick-started it, opened the throttle and eased away in first gear. Changing into second gear with my foot completely defeated me. I looked down to see the lever, and before I knew it, I was in the ditch beside the road, flung clear of the machine while it lay on its side with the engine roaring. Grateful not to be injured and for the bike not having sustained any damage, I walked it back to where I had found it. No other person had seen the incident, and this is the first time I’ve told the tale. Well, I was out walking the other day when I came across this Harley Davidson which brought back memories of my early encounters with motorbikes. Despite them being negative and unfortunate, I was attracted to the chromium-plated piece of engineering, or work of art - however you may look upon such things. From watching a programme on TV, I know of one person who has mounted such a machine on the wall of the lounge of his house, because he considers it to be a work of art, and because it gives him great pleasure to look at. What a talking point it must be too for friends and visitors to his home. 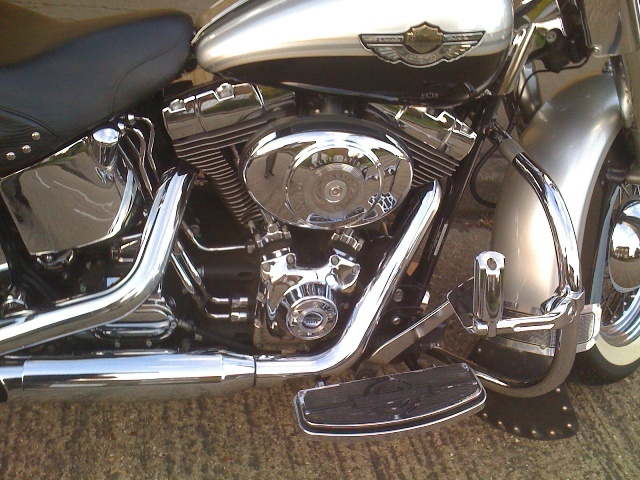 From the insignia on the front of the mudguard, the bike would appear to be a Heritage Softail Classic. 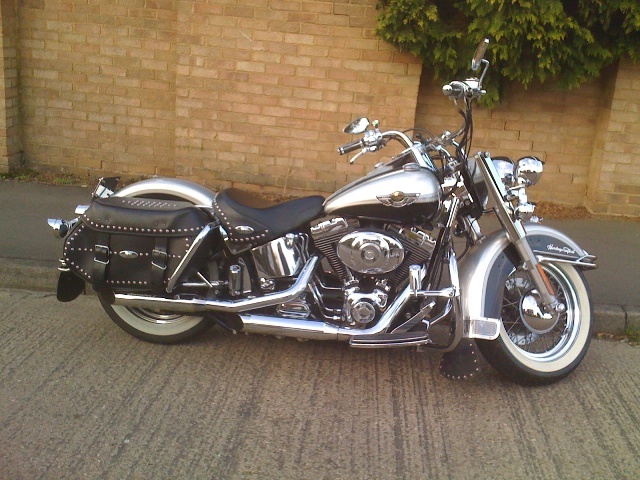 You are talking in the region of £17,000 for a new one and £8,500 or more for a second-hand Softail. 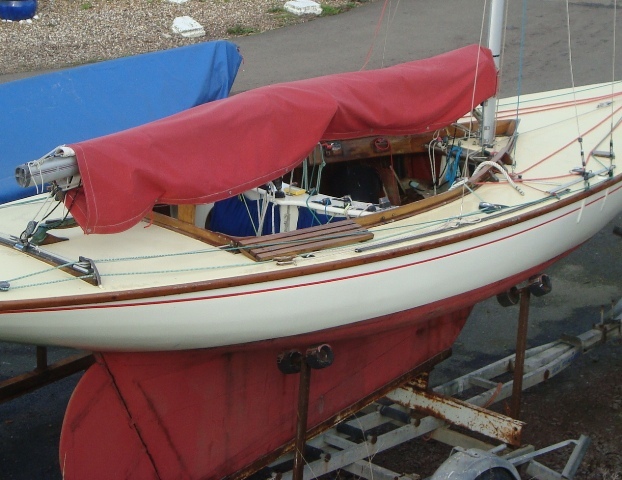 Somehow I feel much more comfortable looking at an old converted ship’s lifeboat than at a Hallburg-Rassy 342. I have memories of such vessels from the 1960’s, sailing in places like Exmouth and at Burnham-on-Sea, where I learned the rudiments of boat handling aboard a friend’s homebuilt sharpie. In 1951 Michael Verney wrote the book, ‘Practical Conversions and Boat Repairs’, which contained a do-it-yourself guide for converting ship’s lifeboats into seagoing cruisers. Many of these were double-ended, 26’ clinker vessels that could be rowed, not dissimilar to Montague whalers, but they were bulkier open boats for accommodating survivors from sinking ships. 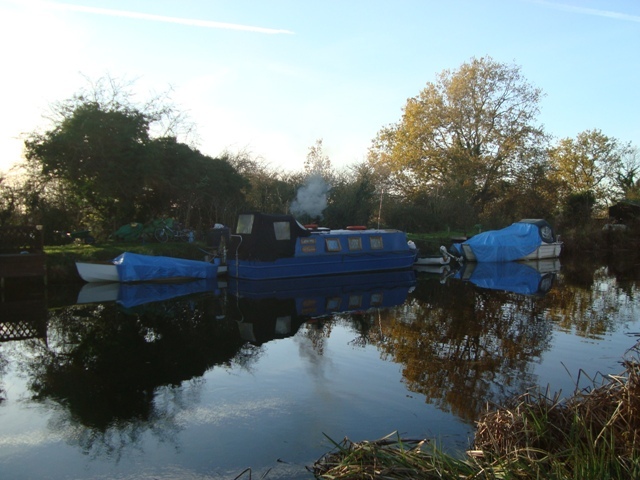 In the same year John Lewis’s book, ‘Small Boat Conversion’, was published; it too had information for converting ship’s lifeboats into yachts. A few of these ‘yachts’ remain in commission today as motor-sailers or as motorboats. Hallburg-Rassy has a reputation for their cruising yachts being a cut above the average in terms of finish and performance. The original Swedish company was founded in 1943 by Harry Hallburg, and in 1972 a partnership was established with Christoph Rassy. Altogether, if Wikipedia* is correct, Hallburg-Rassy has manufactured at least 8,900 yachts. Assuming that number has been built since the merger, they must have produced 19 yachts per month! 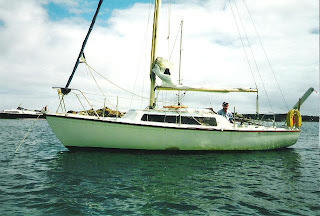 Later models, since 1988, have all been designed by Germán Frers - 15 in total, including the Hallburg-Rassy 342, which is an enlarged and improved version of the 34, designed fifteen years before. By looking at the photos and the ‘borrowed’ drawings, in addition to visiting links below you can see what a fabulous ocean cruising yacht the 342 is. I don’t generally goggle at plastic yachts, but this is a stunner. 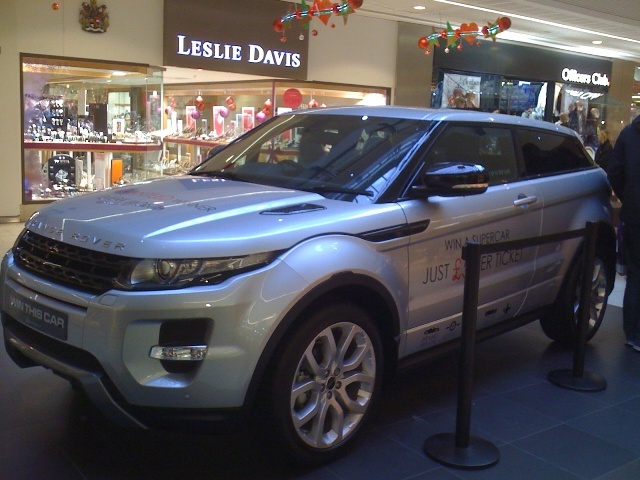 She’s rather too fine for my taste, even if I could afford to buy and maintain her. I would be scared stiff to sit in the lounge for fear of making the cushions dirty, but if I was offered a sail aboard her, I’d accept without hesitation. 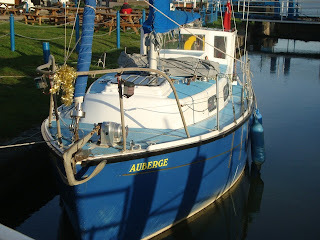 LOA 10.32 m / 33' 10"
Beam 3.42 m / 11' 3"
Draught 1.82 m / 6' 0"
‘Auberge’ a Colvic Sea Rover 28? I can be somewhat perplexed when I research certain yachts by means of the Internet, because of inconsistent information found at different websites. Confusion may be mine in part, as I may not be fully conversant with a particular class of yacht. The Colvic Sea Rover is such a vessel. I was unaware that there were two versions: the 28 and the 30. 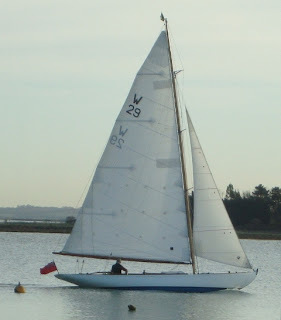 I had thought there was only one, i.e., the Sea Rover 28 motor sailer, but at a brokers’ website I have found reference to a Colvic Sea Rover 30 with distinctly different dimensions to those of the 28. Because I have not been able to find a clear reliable history of Colvic Sea Rovers, I have had to patch together what I believe to be the truth. 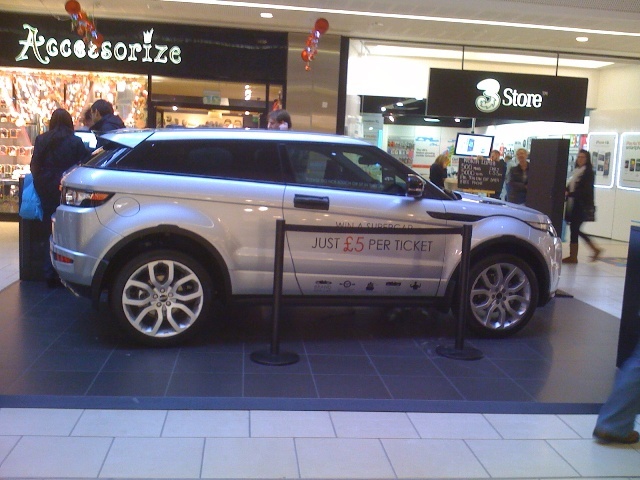 I can only conclude that there are indeed two models. The twin bilge keel 28 has an overall length of 27’ 11”, and the triple keel 30 has an overall length of 31’ 0”. 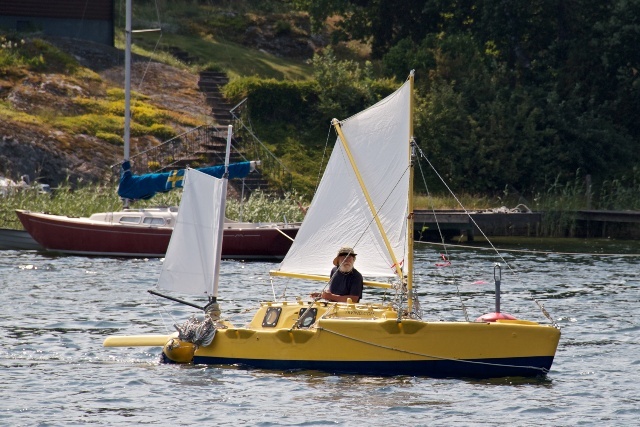 The shorter yacht draws 3’ 5”, whereas the longer, shallow draught yacht draws less, at 3’ 3”. 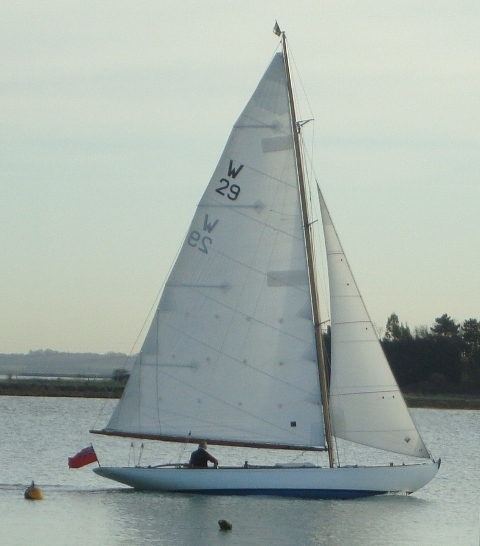 One broker maintains Kenneth Evans was the builder of a Colvic Sea Rover 28 and another quotes Colvic/Thames Marine as the builder. Could it be that these were kit boats fitted out by different ‘builders’? 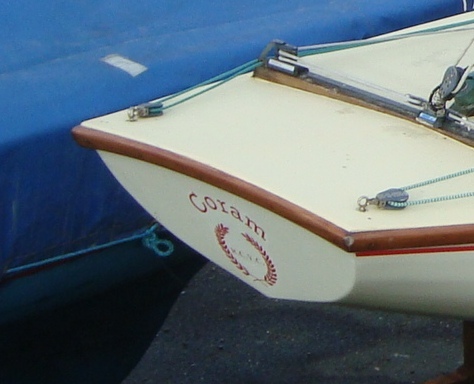 Colvic certainly produced many hulls for owners to complete. Perhaps this is an answer to the riddle? One broker quotes Maurice Griffiths as the designer; another says Kenneth Evans designed her. She does have the characteristic lowered aft deck typical of Griffith’s Eventide 26, his Golden Hind and his Medusa 25, but somehow I don’t think he was the designer of the Rover 28. There’s a note on the website of Eventide.org to the effect that Kenneth Evans designed the Sea Rover. From looking at the photos of ‘Auberge’ I would venture a guess that she’s a Sea Rover 28 to which there has been added a doghouse. 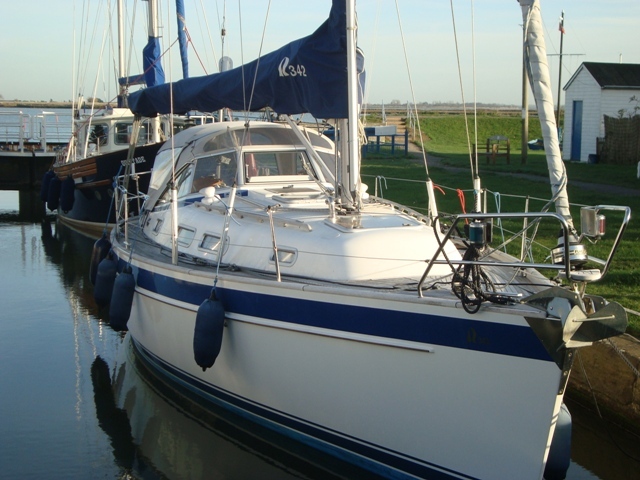 I hope the owner will forgive me for suggesting she’s a bit like a poor man’s Fisher 25; nevertheless, she must be a comfortable cruising yacht. Please contact me through the Comments section if you can answer with certainty some of the implied queries within this article. The Fisher range of yachts were first manufactured in the early 1970s by Fairways Marine, and three of the more popular models can still be built today by Northshore Yachts, namely the Fisher 25, 34 and 37. Altogether at least 140 Fisher 37 ketches came off the moulds, which is a measure of their popularity. They are extremely robust, able cruising yachts that have been thoroughly tested through extensive cruising; hence they can be found in many parts of the world. Over the years they have been developed and improved since the first one was launched in 1973. Very early models did not have an extended bow platform for mounting a very large furling jib forward of the staysail, in the style of a cutter. 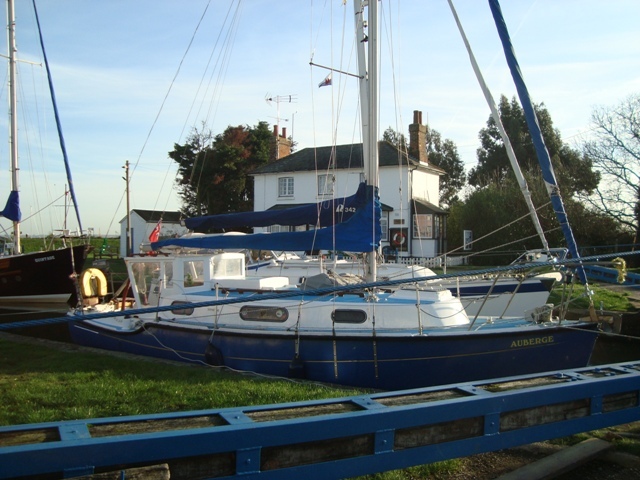 It is most unlikely that I shall ever abandon my land-based lifestyle in exchange for that of a liveaboard, but if I did, I might well choose a Fisher 37 as my new abode, assuming I could find the dosh! 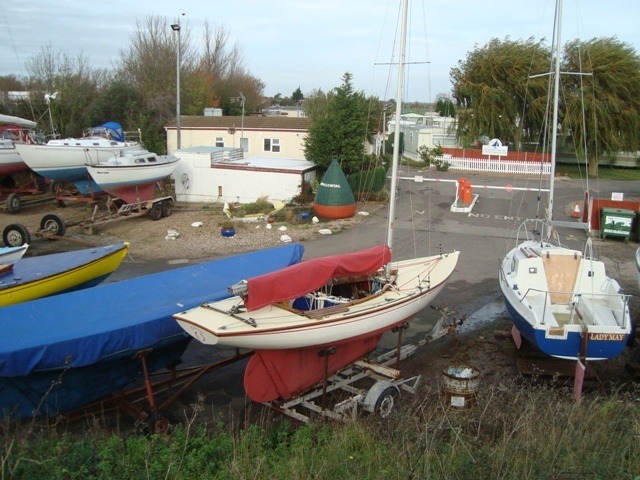 This is my third article featuring Heybridge Basin. Rather than doing a screed I’ll direct you to the links below. If you are into nautical things you will not be disappointed with a visit to the Basin. 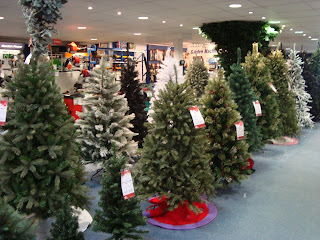 These photographs will add to those of my previous articles to give you a flavour of the place. Incidentally, Max of Bursledon Blogger has suggested that Heybridge should be twinned with Bursledon, as they both have Jolly Sailor and Old Ship public houses at their waterfronts. 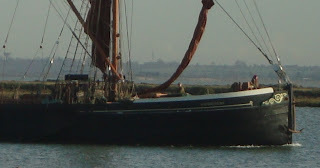 Yesterday’s subject was the Thames sailing barge ‘Hydrogen’. 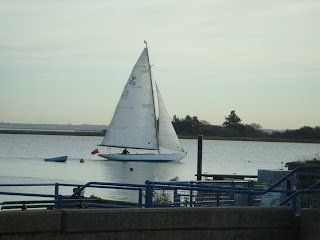 I saw her at Heybridge on Saturday. Only ten minutes before seeing her, a very graceful classic yacht sailed past the lock gates. 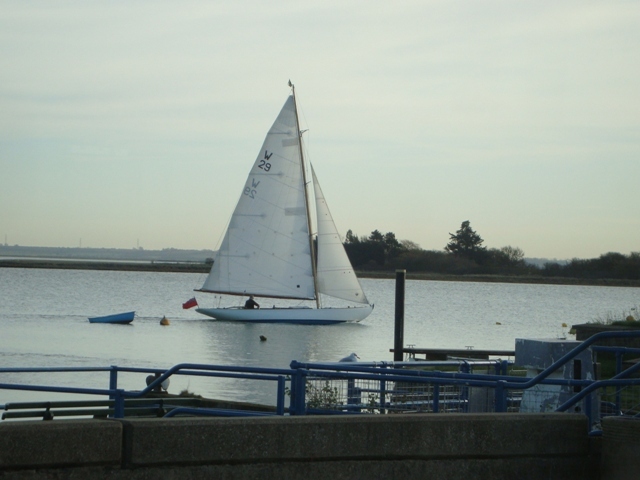 She was heading up river towards Maldon. I have subsequently discovered this elegant Edwardian yacht was ‘Mischief’, a West Solent One Design. This class of yacht was designed by H. Jacobs and H. G. May in 1924, and they were known as ‘W’ Boats. 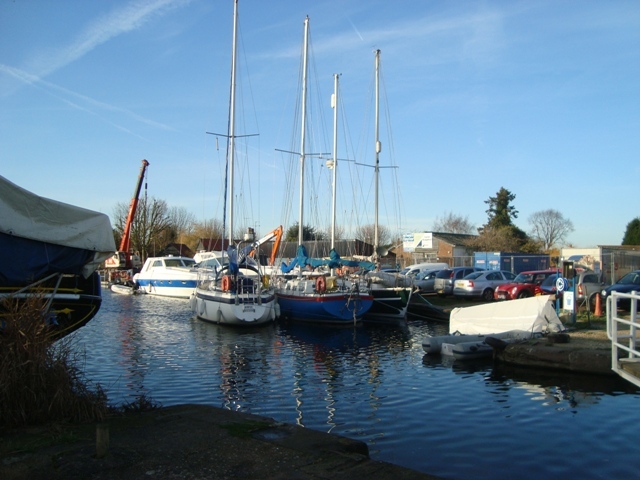 The Berthon Boatyard at Lymington built 30 in all, and another was built under licence in India. 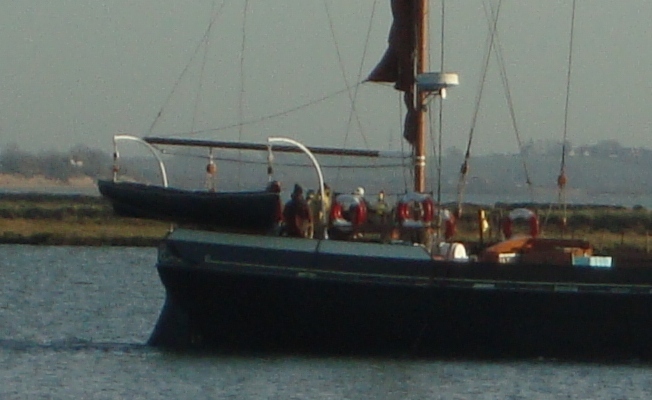 ‘Mischief’ was completed in 1930 and she was restored to pristine condition between 1992 and 1993 by Brookes Classic Boatbuilders. Yesterday I was at Heybridge Basin looking at the yachts. While having lunch at the Old Ship Inn I was excited to see the Thames sailing barge, ‘Hydrogen’ making her way upriver towards Maldon. It was about high water, and a few yachts and dinghies were out sailing in lovely sunshine, as a gentle west wind caressed the water. At that point ‘Hydrogen’ had doused all sail, finally dropping the peak of her spritsail. Very sensibly, her fisherman anchor hung from the stem head, ready to let go if needed. Two men at the bow looked as if they were preparing lines for coming alongside the wharf at Maldon which is her normal berth. A summary of the history of this fine old wooden vessel, first launched in 1906, can be found at the website of thamesbarge.org.co.uk;* since then she has been in almost continuous service earning her keep. 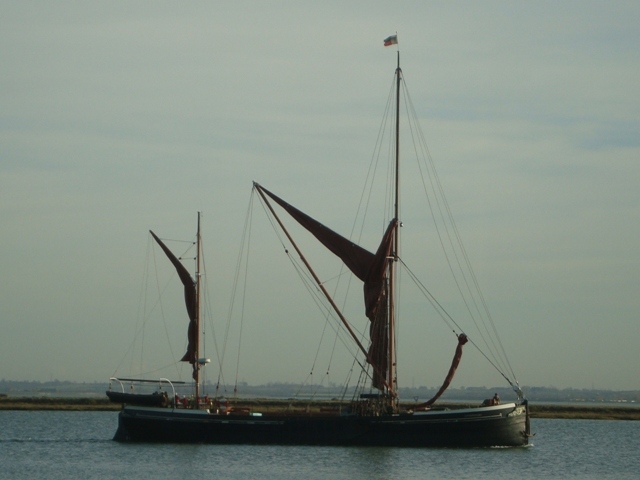 After a short period when she was powered solely by her engine, she was re-commissioned as a sailing barge in 1978 at the behest of new owners. They reinvented her as a mobile entertainment facility that visited ports around the UK. I believe she is owned by the Blackwater Barge Company. 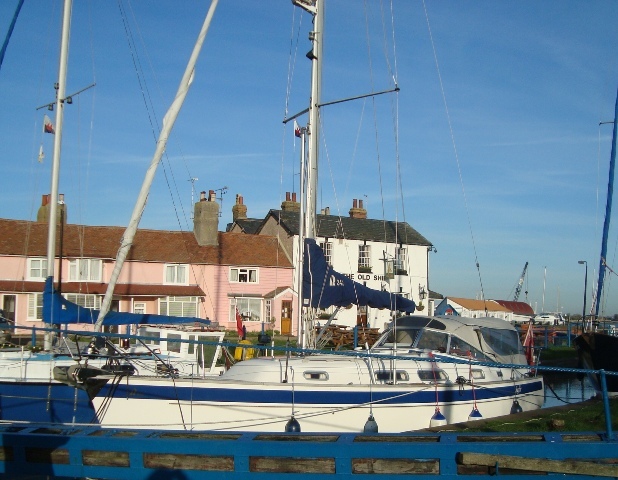 As from 1992 Topsail Services have chartered her along with four other barges: ‘Thistle’, ‘Cabby’, ‘Reminder’, and ‘Kitty’ for providing a number of activities throughout the year, including day sailing excursions, private hire, promotions etc. I don’t always get things right, therefore don’t believe that what I write here is a hundred percent correct. I’m fallible like most of us mortals. For proof of my fallibility, although proof is not required, click the link below. * There you will see a photo of ‘Whimbrel’, a Royal Burnham One Design that I mistakenly thought was a Royal Corinthian One Design – my apologies for getting it wrong, and thank you to ‘chudgrower’ who pointed out my error which I have just discovered. I shall in due course make a note to that effect at the page mentioned. Anyway, here’s a nice photo of a genuine Royal Corinthian One Design (‘Coram’) on the hard at Rice and Coles. I am not nostalgic about ‘Ladybird’, although I do have fond memories of her. When I sold her to my daughter I pondered what future the little boat may have. Because of changing circumstances she sold her to yet another who would become acquainted with her excellent qualities. For a 19’ yacht I don’t think there is one with better accommodation. 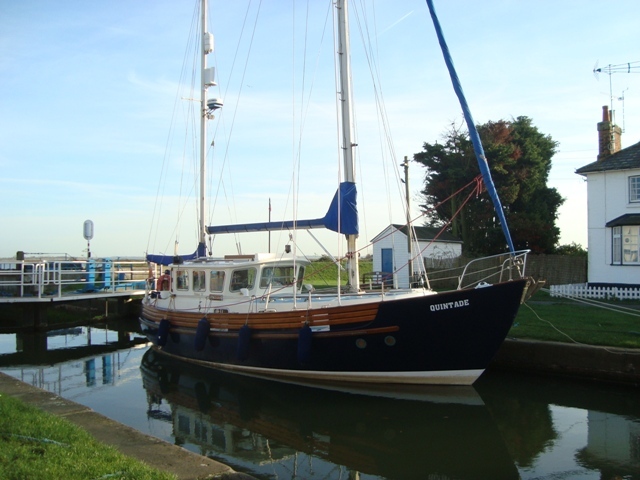 She has two spacious quarter berths and plenty of room up forward for a third person. There is ample stowage for gear and provisions under the bunks. A curtain gives privacy for use of the chemical toilet, and she has a very convenient galley by the companionway. Her cockpit is large enough for three, or possibly four crew members, but it’s perfect for two. Under her cockpit seats there’s plenty of space for warps, fenders, a second anchor, ship’s battery, fuel etc. Her cockpit self-drains. Within easy reach of the cockpit she has a Honda 2.3 outboard motor which is sufficient for getting in and out of marinas, even for pushing her along at 3 knots, hour after hour when the sea is calm. A 4 HP to 5 HP engine would be better to provide clout when there is a strong headwind. Her side decks are just wide enough for access to the foredeck where the anchor is ready for immediate use, having a galvanised chain that leads through a hawse to a locker below. The deck and hull mouldings are substantial and well finished. She has a furling Genoa and a roller boom for reefing her Bermudan mainsail. Her stainless steel standing rigging is adequate in strength, and her safety rails are supported by strong stanchions, a pushpit and pulpit. She is equipped with navigation lights, one either side of the coachroof and the stern light attached to the pushpit. The solar panel mounted on the coachroof never let me down, always providing power for the navigation lights and equipment, including two GPS units and an Autohelm. I was careful how I used the cabin lights, not to leave them on when I didn’t need them. She’s not the fastest 19 foot yacht, but her performance on all points of sail is satisfactory for coastal cruising and Club racing. With a competent crew she should be competitive in handicap racing with a favourable Portsmouth Yardstick of 1216. Reefing the main early when the wind rises is the key to success when sailing to windward. Her encapsulated twin bilge keels are not the best for settling on hard ground, but they are fine for sand or mud. 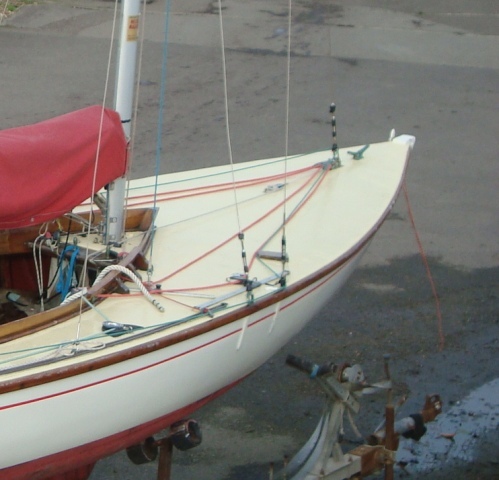 Care should be taken when settling on soft ground, because she has a tendency to settle by the stern, and as she does not have a skeg, undue pressure can be brought to bear on the rudder which needs to be locked in position so as not to be dislodged from the pintles. 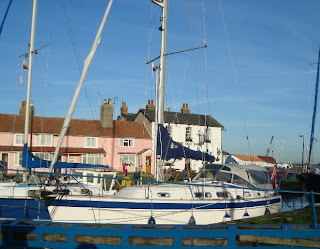 The photos show how she is laid up at Rice and Coles, at Burnham-on-Crouch. Incidentally, I’ve been invited for a sail aboard my old flame, sometime next year, and I am looking forward to it and to meeting her latest owner.